Never throw out a bead no matter how small it is as one day they will come in useful. 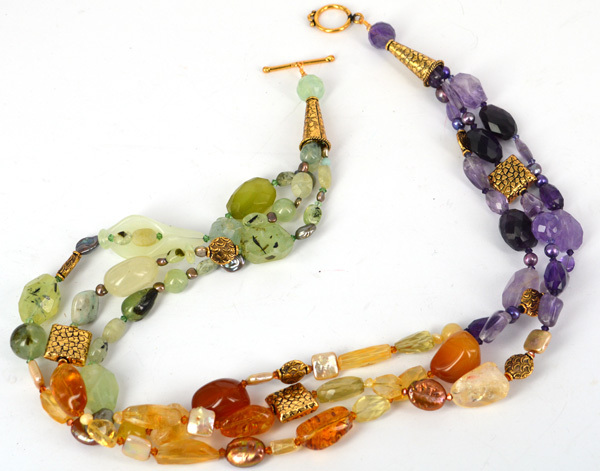 I have just finished this beautiful Amethyst, Citrine and Prehnite gemstone necklace using beads I have had in my collection for over 12 years. This is what I would call random design necklace, but as I threaded each strand I made sure that the larger accent beads were evenly spaced along the strands so there were no "heavy" or "Empty" areas.